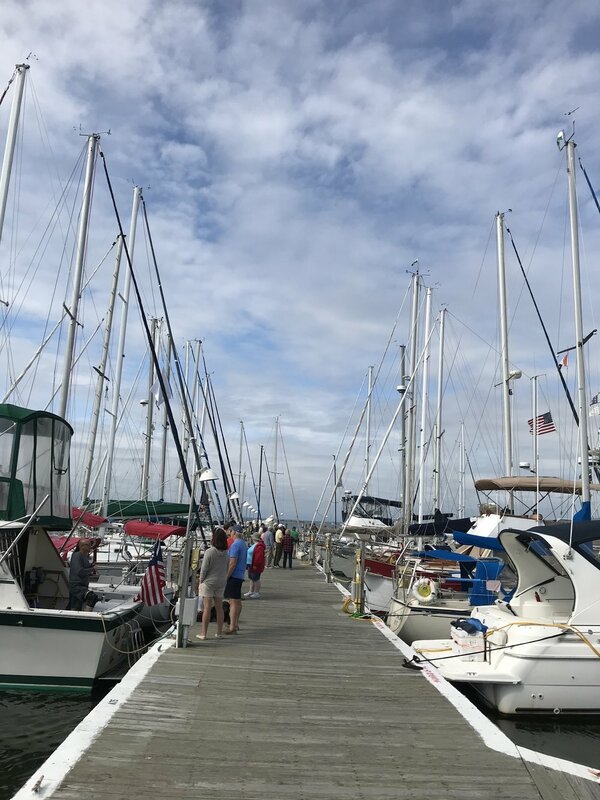 The forecast for Saturday’s Discoverers Race was for clear skies, temps in the lower 70’s and an easterly breeze around 10 knots. The wind was South East around 10 knots but the sun forgot to come out except for a half hour after the race. The sun could not prevent a great group of 18 boats from racing to Atlantique from the Green #1 Buoy off of Bay Shore. Turn the Page a J70 boat took Line Honors as the first boat to finish the race and won the Bay Shore Yacht Club Raymond G Terry Cup! The first SBCC Discoverere’s Cup racers to finish were the crew aboard Merry Ann, who sailed a smooth race in well under 2 hours. Full Circle followed behind for a second place finish, although the Full Circle crew ran aground in West Channel for about 5 minutes, they were still able to come back to a second place finish. Shadow with her new black sails was sailing tight to the wind and came in third. Windswept came in fourth behind Shadow. Would be nice to see Windswept race more frequently since she is well equipped to make a top 3 finish in almost any race. Maggie Lee edged out Intrepid who made up the almost 2 minutes late start they had across the line, imagine they started on time they could have been 4th or 5th. Bleu Moon just beat out Aleboat for 7th place. Bleu Moon and Aleboat traded tacks the entire race, sometimes with Bleu Moon on the starboard tack with the right away and sometimes Aleboat on the starboard tack with the right away, in the end Bleu Moon was a boat length ahead of Aleboat for 7th and 8th place respectively. Jolly Mon and Fancy Nancy were ahead of the pack as they were approaching Fire Island, but something was affecting their progress towards the finish mark. The current was pulling out towards the inlet from East to West at an angry pace. With the tide knocking knots off the boat speed over ground both Fancy Nancy and Jolly Mon were feeling the affects. When asking Skipper Lenny from Fancy Nancy about the tide he said “I hardly could notice it” in a joking manner which really meant “it felt like we were sailing backwards”. Pelagic had a nice finish in 11th place with 3 sails flying proud, his Main, Jib and Mizzen. 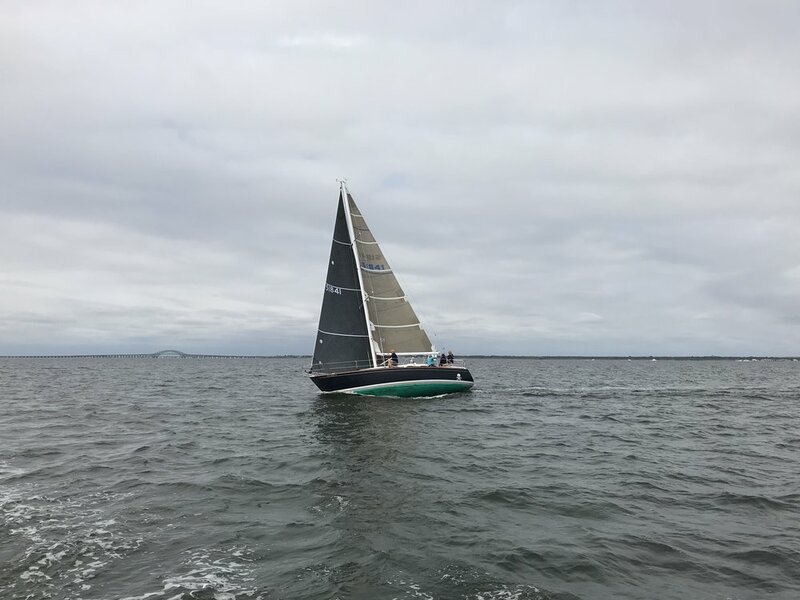 Eagle at Tartan 27 had made the race all the way from Bellport. The race started at 11am, which would have meant a really really early departure from Bellport to make the 11am start in Bay Shore. Good thing Fred and Mara sailed from Bellport and anchored in Great River for the night before to be closer to the start in Bay Shore, great planning and thanks for making a 2 day travel to race with everyone. Noddy was happy with his 13th place finish ahead of some boats he has been racing against neck in neck this year. Watercolor always tried their hardest and this race was no exception. Christy and her husband sailed their McGregor well and managed to beat out Snoopy and Bertha. Snoopy a Catalina seemed to be sailing well at the start of the race, we are happy they battled it out to finish over at Atlantique. Bertha finished out the race in 16th place but no one minded looking at this beautiful Cat boat tacking her way up the West Channel and towards Fire Island. This classic looking boat was like no other boat racing, with just one enormous main sail, wood spars, beautiful classic lines, stern hung rudder and overall pretty appearance, every boat had something like “look at that pretty boat racing” as they sailed passed. After the race there were party heros and salads with a nice gathering at the end of the dock. There were many comments like “I’ve never seen so many masts at Fire Island”, “So nice to see this many sailboats”. There must have been around 35-40 saiboats docked at Atlantique between the Racers and the Cruisers. Many boats brought their children or grandchildren who enjoyed pumpkin painting, bubbles and playing on the dock. It was a great day at the beginning of October like this that makes us wish the season was just starting and not wrapping up. Lets have a turnout like this for the Spring Race To Atlantique!